I don’t have anything against it. In fact, I love how the snow slows everybody down, muffling the daily chatter like a scarf wrapped around your ears. It makes ski trips more enjoyable, and skating rinks appear Rockwellian. I even love that it makes daily life a little bit harder, so when the nice weather finally arrives, we don’t take it for granted for a single second. I don’t however, love shoveling. Especially when mother nature dumps six feet on us in three weeks. After the first snow, you can just sort of push it to the side of the driveway, but at this point the snowbanks are as tall as Larry Bird so I end up having to twirl the shovel around like I’m throwing a discus and heaving the snow up over the bank. The worst is when it rolls right back down, or when you discover a little scoundrel walking along behind you, laughing maniacally as he shovels snow out of the snowbank and piles it back onto the driveway. I wonder if the street plow driver laughs, too, when he snows us in again by pushing a foot of heavy brown sludge along the end of our freshly cleared driveway. If this sounds all too familiar, then you’ll understand when I tell you I’m not above using bribery to enlist helpers. The drug of choice? Hot chocolate + marshmallows. Only, when it snows this hard for this long, we quickly run out of supplies which is how I began a quest for the perfect homemade marshmallow – thick and spongy with just a hint of flavor. I had many opportunities to practice. 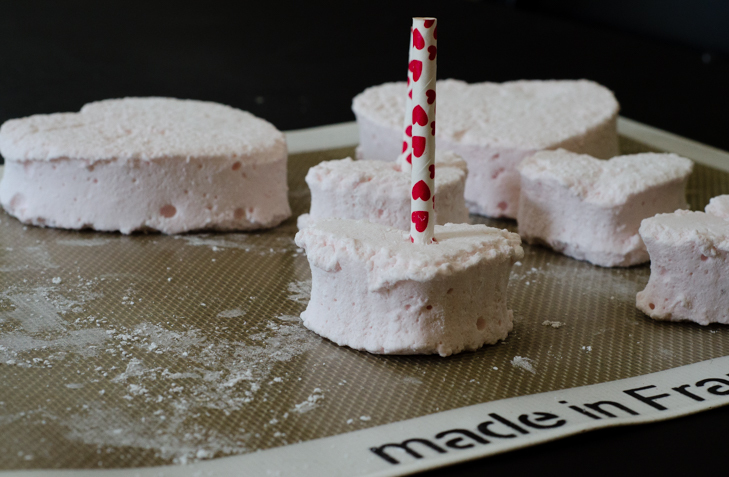 It turns out that too much corn syrup makes the marshmallows taste like plastic, and using egg whites complicates the process and makes the texture too chewy. 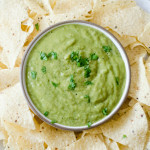 If you add extracts too early they taste like bitter, cooked alcohol, and food coloring is just weird. I cut this recipe into heart shapes for the holiday, but my favorite is traditional squares. They’re craggier than the smooth supermarket variety and much yummier. Pass these around the next time it snows and the neighborhood shovel patrol will take care of you for the rest of the season. 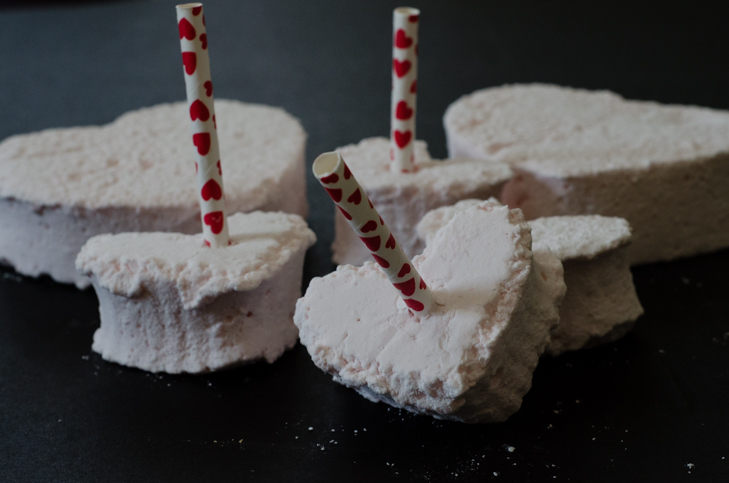 These strawberry-flavored marshmallows are a great gift idea for your favorite valentine, or serve with hot chocolate for a special snow-day treat. I found this recipe during our second snowstorm of the season, after running out of store-bought marshmallows. They’re not too tricky to make, but anytime you work with sugar you have to work fast – sort of like when stir-frying – so you need all of your ingredients measured and ready to go before you start. I tried making them with the kids but realized halfway through that hot sugar isn’t the best medium for a four-year-old. Instead, surprise them with the finished product, or let them help you with the pouring at the beginning. Plop them into a steaming cup of hot chocolate for a strawberry infusion or serve alongside. 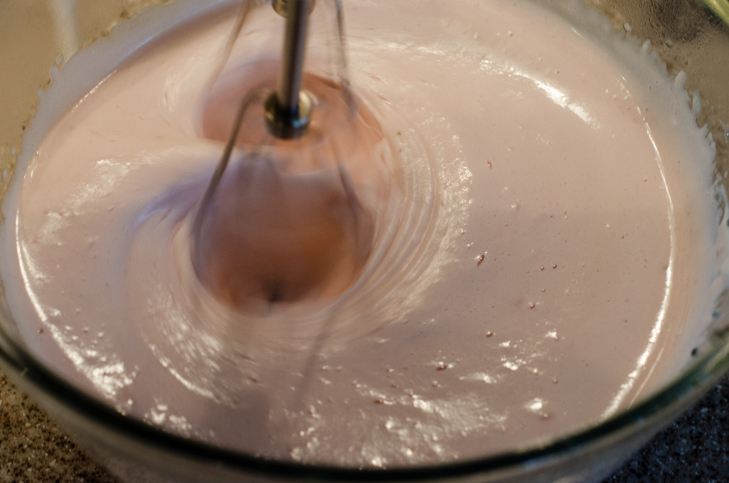 For plain marshmallows, substitute 2 teaspoons vanilla extract for the strawberry extract. For mint marshmallows, substitute 1 teaspoon mint extract. The recipe yields about 16 squares, about 2 inches thick. Butter the bottom and sides of a 7 x 11 inch (or equivalent) pan and evenly sift ½ cup confectioners’ sugar along the bottom. Tap the bottom and sides to remove excess. Combine 1/3 cup of the water with the sugar, corn syrup, and salt in a small pot over medium-low heat. Stir with a spatula until the sugar dissolves, then allow the mixture to boil, undisturbed, until the temperature reaches 240 degrees F on a candy thermometer. This will only take about three minutes, so monitor the liquid closely. If using a hand mixer: Pour the remaining 1/3 cup water into a large heatproof bowl and sprinkle the unflavored gelatin on top. 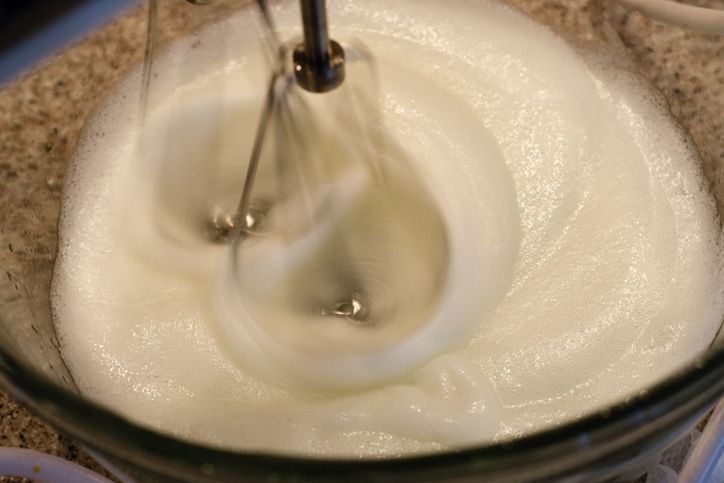 If using a stand mixer: Fit the mixer with the whip attachment and pour the remaining water into the bowl of the mixer. Sprinkle with the unflavored gelatin. 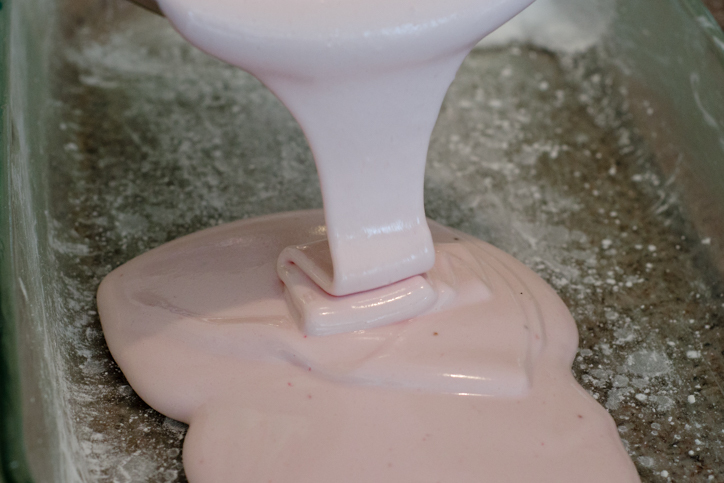 When the sugar reaches 240 degrees F, turn the mixer on medium-low and pour the hot sugar mixture carefully down the side of the bowl so it doesn’t spatter everywhere. Slowly increase the speed to medium-high and beat for two minutes, until the mixture cools slightly and the gelatin is fully incorporated into the sugar syrup. 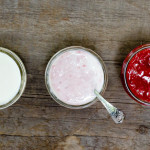 Add the strawberry extract (or vanilla extract) and continue beating for about 10 minutes with the hand mixer (7 minutes if using a stand mixer), until the mixture is shiny, smooth and thick. 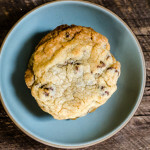 *I’ve tried making this recipe both ways and though the hands-free stand mixer is nice, I think it works better with the hand mixer. Pour the mixture into the prepared pan, smoothing the top with a spatula. Let it stand, uncovered, for 8 hours or overnight. 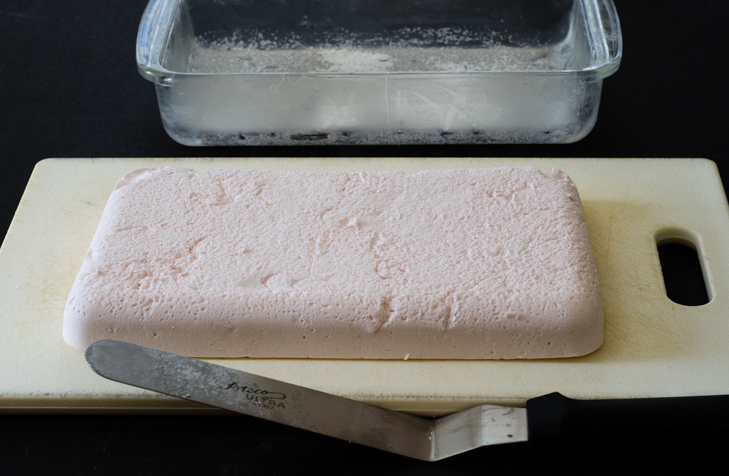 Once the marshmallow is set, run a knife or a small offset spatula around the outside of the marshmallow to loosen it up and turn it out onto a clean surface sifted lightly with confectioner’s sugar. Rub a serrated knife (or cookie cutter) with vegetable oil and cut the marshmallows into squares or shapes. It’s much easier if you wet your fingertips when handling the sticky marshmallows. Sift the remaining ½ cup confectioners’ sugar into a small bowl and roll the marshmallows in the sugar to coat. Serve or hold in an airtight container for up to 4 days.